Yay! It’s Finally Here – Knitted Krock Socks! I’ve been ogling the Crocheted Krock Socks for some time now, thinking I might have to actually wield the crochet hook to get these, but now….. they’re here, and in the knitted variety! Click HERE to go to Ravelry for the Krock Socks Pattern! 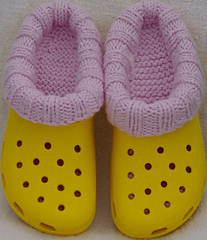 Love these, but I don’t knit. Anyone know how to translate to crochet?